Forty round diamonds, at approximately .88 carat total weight, glimmer brilliantly in this stunning halo engagement ring setting. Your chosen center 1.00 carat round diamond will beautifully complete this setting and be surrounded by smaller round diamonds that outline the halo frame. This lovely ring is crafted of quality 14 karat white gold and features each hand-selected diamond in a pavé setting. 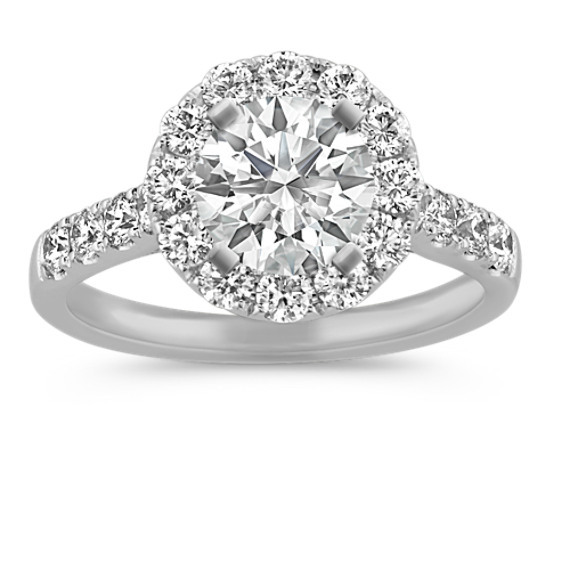 The band of the ring is approximately 2mm wide while the halo is approximately 11mm wide. Gemstone Carat Weight :.88 ct. t.w.